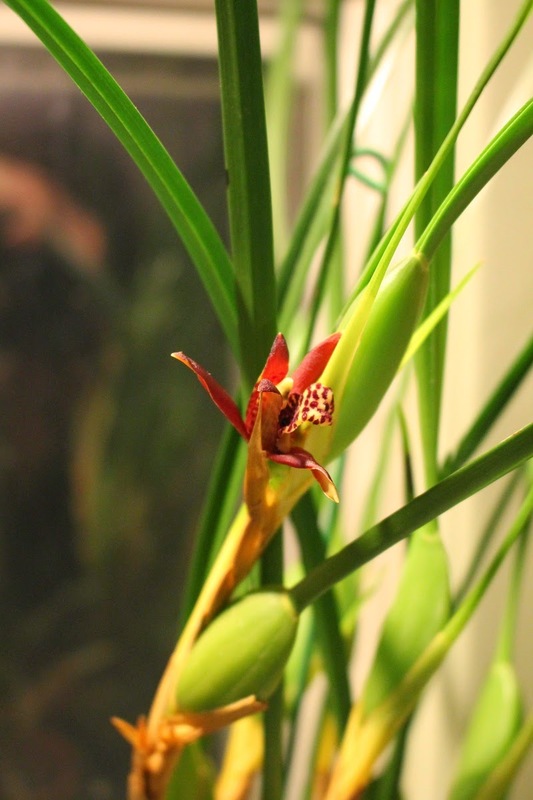 I am particularly excited about the coconut orchid bloom (above) because this is the second time I've grown Maxillaria tenuifolia - and it's the first time I have overwintered it successfully! I'll be sharing my trick in a later post. Phaleanopsis orchids are much easier to overwinter, but it's been particularly fun to see this one start blooming. 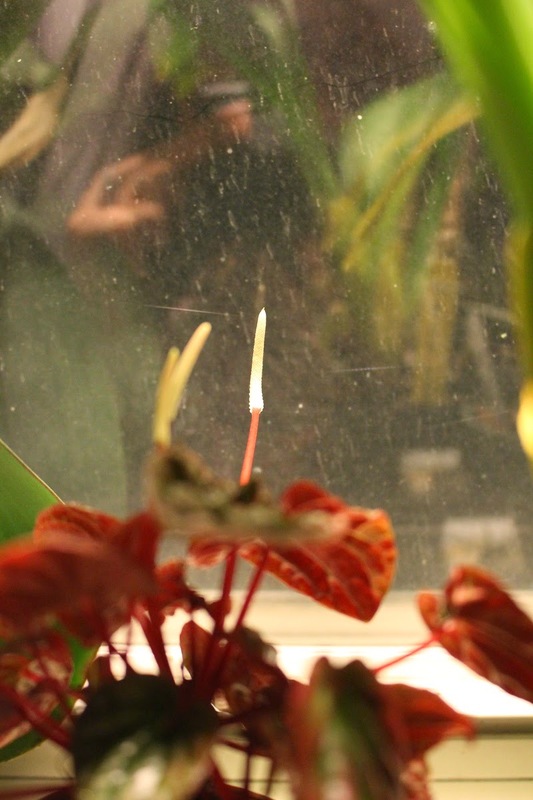 I had to stake the flower stalk (which has been growing since December!) and the flowers seem all topsy-turvy as a result. A tiny pot of peperomia, which I nestled on the window sill between orchids to give it some humidity - and so I would remember to water it - is also blooming. Perhaps to show its appreciation? Speaking of tiny... assuming that all continues to go well, we will have another tiny thing to care for in September. Baby M is due around September 11th, and has kind of thrown a wrench (a very welcome wrench!) in our plans to put the house on the market and move this spring. :-) So I have decided to embrace the garden again for one more year... and to resurrect the garden blog as well. For more of what's popping up this April in gardens around the world (and maybe outside of gardens, too!) check out Carol's Garden Bloggers Bloom Day post on April 15th. A quick note, to round out my GBBD: It's too early for anything to be blooming outside here... Lake Erie keeps us fairly cool in the springtime, and it's been a long winter! But I do have tulip and paperwhite foliage popping up in the yard, and my Meyer (Improved) Lemon is also blooming in the dining room. A beautiful orchid for sure. I will be curious about your tips for winter care. What lovely news, Kim! 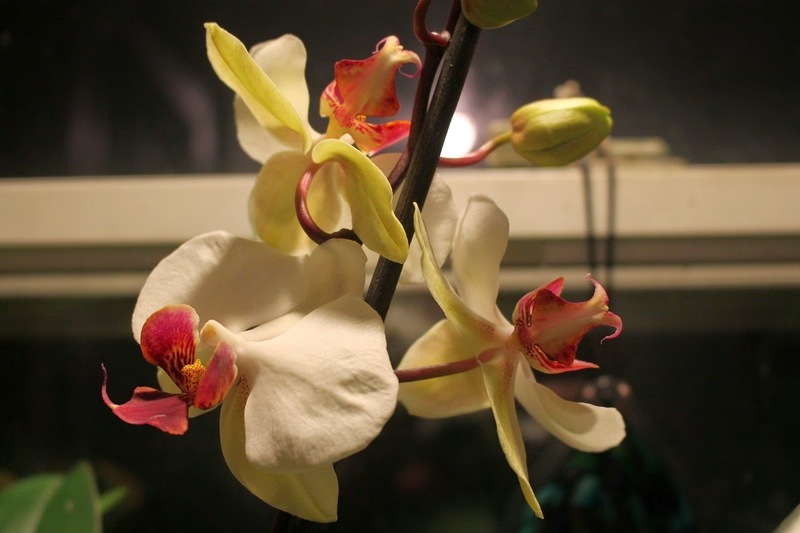 (Both the orchids in bloom and the new sprout). You do have A/C, right? Then you'll be fine. You can pop in and out and every time you sit down, put your feet up. I totally forgot about the existence of peperomia - used to be a favorite in IL. Thanks, Garden Broad! I actually took pictures of the orchid setup already, so I should have a post up here soon. Annie, yes... I usually hate A/C, but I hear that I'll be happy to turn it on this summer! lol. Happy Bloom Day! I also will be looking forward to the post about those lovely orchids. They seem so intimidating to me.